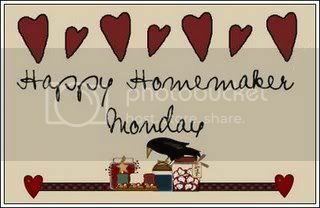 It’s Monday so here’s another Happy Homemaker. To see what others are doing head on over to our wonderful host Sandra @ The Diary of a Stay At Home Mom. Steaks, weight watchers vegetable Stir Fry. (yes I’m counting again) & Rice. Confirm mum’s flight to BKK. Sign up to be a secret reader at Tanysha’s school. Book Week this week. Walk every morning this week. Unfortunately have not had the time to experiment. Will attempt to put together a book character costume for Tanysha's Book Character parade. Having my mother here, again. Don’t have any tips to share for this week. Sorry. Haven’t been surfing again so don’t have a favorite to share. To spend more time with my children, especially my son. I have a great nanny who loves to take care of my son and lately I have been taking advantage of this a little too much. This is a season, my son, my girls will all grow up soon and I will have missed it. So my lesson is to not be overly committed here and there and to purposefully slow down and chill at home with my children. With so much around us today, both good and bad we need to keep watch, be attentive, cautious, observant and aware. Minute by minute, moment by moment. Not only of our own hearts but also that of our children’s.